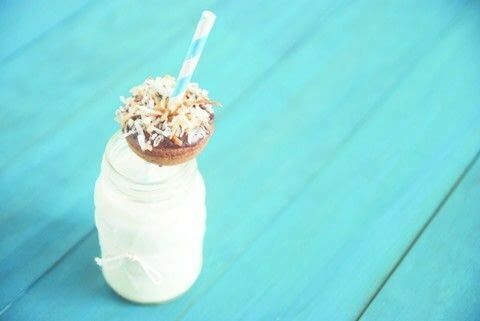 This little mini donut sure does pack one heck of a coconut punch. Yields 30 Mini donuts Between coconut extract, coconut milk, and toasted coconut on top, it’s like a mini coconut explosion! And when you combine that coconut explosion with, of course, chocolate, you’re in for a mini donut that will knock your socks off! Toasted coconut: To make toasted coconut, preheat oven to 350oF. Spread sweetened shredded coconut on a foil-lined baking sheet and bake for 5 minutes, stirring often, until light golden brown. Let cool, and then use as homemade sprinkles on top of all of your favorite mini donuts! If using an electric donut maker, preheat according to manufacturer’s instructions. If using donut pans, preheat oven to 350°F and grease donut pans. In a medium bowl, whisk together egg and sugar. Then add milk, coconut milk, oil, sour cream, and coconut extract, mixing until thoroughly combined. Gently stir in the flour mix- ture, stirring until there are no lumps. If using mini-donut pans: Carefully fill each donut indentation 3⁄4 full. Bake for 7–9 minutes or until a toothpick inserted into a donut comes out clean. Transfer donuts to a cooling rack and let cool completely. If using an electric mini-donut maker: Carefully fill each donut indentation 3⁄4 full. Bake according to manufacturer’s instructions or until a toothpick inserted into a donut comes out clean. Remove donuts from appliance, transfer to a cooling rack, and let cool completely. Place wax paper under a wire rack to collect any drippings for an easy cleanup. Then, in a small saucepan over medium heat, melt butter. Add coconut milk, corn syrup, and chopped chocolate, stirring slowly to allow chocolate to melt completely. Once melted, remove from heat and whisk in powdered sugar. Immediately dip the top of each donut into the icing, then dip into the toasted coconut and place on a wire rack to cool. Let icing set for 10 minutes and then serve. Donuts can be stored in an airtight container for up to 2 days but are best when eaten fresh.